There are moments in history that shape the future. Some of these moments are obvious, like the bombing of Pearl Harbor, the assassination of President Kennedy, or the terrorist attack on 9/11. If you lived through one of those moments, you understood that something had changed—from that moment on the world was going to be different. I want to take you back to another moment that changed the world. It took place at a small river in northern Italy in the year 49 BC. The name of the river is the Rubicon. North of the Rubicon was Julius Caesar, the most powerful general in the Roman Republic. He had been stationed in Gaul, where his popularity was increasing—and so was the size of his army. South of the Rubicon a few hundred miles was the city of Rome. In Rome, Pompey and the Senate were growing fearful of Caesar’s increasing power. So they sent him a message, “Disband your army and go home.” Instead, Julius Caesar marched his army south, right to the edge of the Rubicon. You see, there was an ancient Roman law that forbade any general from crossing the Rubicon with a standing army… to do so was treason. 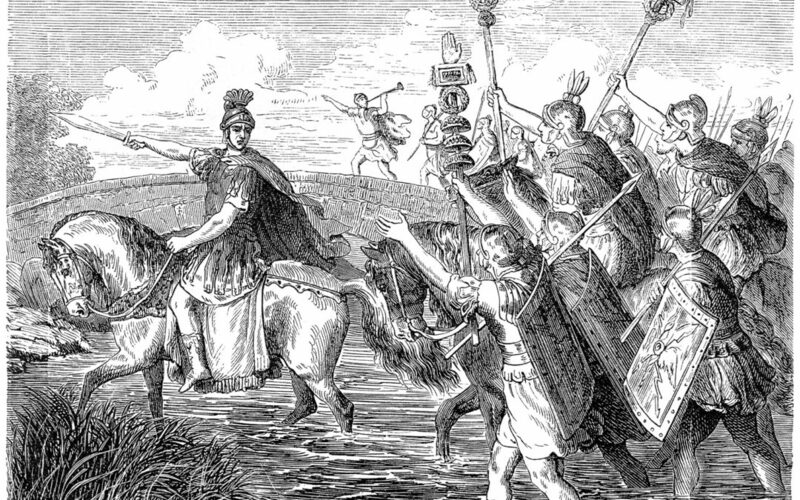 When Caesar and the 13th Legion reached the Rubicon, he turned to them and said, “We can still go home, but once we cross this river there is no turning back. There will be nothing left to do but to see this through.” The legion reacted with a roar, and Caesar cried out, “The die is cast.” He rallied his men, and together they crossed the Rubicon. “The die is cast.” If you have ever played dice, you have a picture of what that phrase means. It is the moment when the dice are in the air. There is no stopping them, and only God knows how they will land. Our Lord Jesus Christ took on flesh and entered into enemy territory. He did not have to do that. He is all powerful. He is one with the Father and the Holy Spirit. He could have destroyed his enemy—Satan—with a single word. Instead he came to earth, lived out the gospel, and then placed that gospel in fragile jars of clay—weak, broken, seemingly insignificant people like you and me—to win back souls firmly held in the grip of Satan. We are the hands and feet of Jesus here on earth—equipped only with the gospel and the gift of faith, but that is enough. It is the power of God. In 49 BC Julius Caesar was named dictator of the Roman Republic, and in 48 BC he defeated Pompey to end the civil war he started when he crossed the Rubicon. But Caesar’s reign would be short. On March 15, 44 BC, he was murdered by a close friend and a group of assassins. There are moments that change the world, and then there are moments that change eternity. The Bible tells us that our Lord and Savior Jesus Christ was also betrayed by a friend—by a kiss. He was crucified, dead, and buried. But unlike Julius Caesar—who would stay dead—Jesus Christ rose again, and his resurrection set in motion a kingdom so powerful that the gates of hell cannot stand against it. Sometimes in this fallen world it looks like Satan is winning, but there are cracks in the gates of hell. God is using his Church to peel back the fingers of Satan and to set the lost free. People of faith, there is no turning back. We have crossed the Rubicon, and the only thing left to do is to see this through. The die is cast, the road uncertain, but God knows the outcome—he knows how the die will land. The victory is guaranteed. Rev. Troy Tysdal is Director of Communications and Prayer for the Church of the Lutheran Brethren and serves as editor in chief of Faith & Fellowship magazine.